Jena began training animals at the Kansas City Zoo where she spent 5 years learning training techniques and how to navigate different behavioral issues. Jena has worked with a range of different animals including California Sea Lions, African Elephants, Gorillas, and Leopards. When she decided to work with dogs, she spent months learning how to transfer her training and behavioral knowledge to dogs. Jena has an immense amount of animal training and behavior modification experience. Not every dog is the same and there is no cookie cutter approach when working with dogs. Jena’s experience over the years has given her the opportunity to think outside the box and to share her knowledge with her clients. She is able to teach them how to effectively maintain wanted behaviors and discontinue unwanted ones. 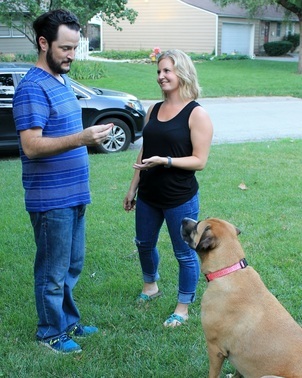 What really sets Jena apart from other trainers is her ability to teach her clients how to build a happy and healthy relationship with their dogs. Does your dog need house manners? Do you want to start your puppy off on the right paw? Are you tired of being embarrassed by your dog? Do you wish your dog would listen to you when there are distractions around? We have created packages that can help you with all this and more! Does your dog bark at other dogs while walking on the leash? Do they get easily excited when they see new people? Do they run out the front door every time the door opens? Does your dog's temperament fit a Therapy Dog but needs the training? Whether you are having serious dog problems or would like to refine all their obedience skills this package is for you. We will take the time to address the issue you have and give you all the training you need to live a happy life with your dog. Are you too busy to put all the time into training your dog yourself? Do you want some help but can’t stand the idea of shipping your dog off to doggy camp? This is perfect for you. While you are at work we come to your home and train your dog for you. Weekly meeting with you to discuss progress. The number of weeks needed differ for each dog, This will be discussed at the consultation. Are your dog's actions embarrassing you? Are you constantly apologizing for them? Let us help you teach your dog what you want them to do instead of punishing them for not knowing what is right. This package will allow us to refocus your dog and teach them to listen to you. Is your dog fairly well behaved but you have a couple behaviors you would like changed? Do they jump on guest or bark at the mail man? There is no reason to have to put up with it anymore! This training program will allow us to touch on minor trouble behaviors and refine their obedience skills. “Jena is amazing! We recently had our first human child, so our first born fur baby needed to relearn some behavior skills that we had always let slide in the past." Let us help you with your dog or new puppy! Start learning skills early to fight off bad habbits.